Donald Audley Stewart (1902 -1987 ) was an ordinary chap, just one of the hundreds of ordinary folk who lived and worked in Bollington over the past couple of centuries. Why do I (Tim Boddington) pick him out for a page? Well, simply because I knew him, I liked him very much and he told me an interesting, if hair-raising, anecdote from his life (see below). 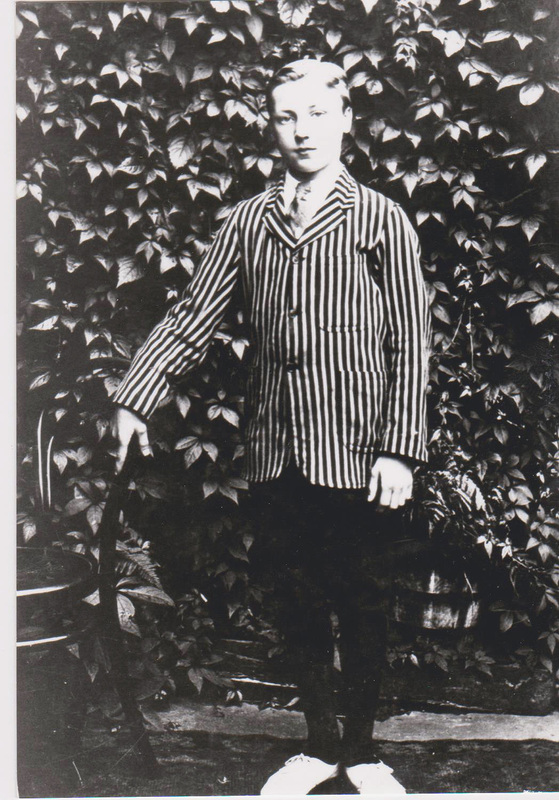 He was born in 1902, one of nine surviving children, all brought up in Rock Cottage (built in 1830 at the top of Beeston Mount). Donald’s father was Joseph Stewart, and from 1900 he and his family lived at Rock Cottage. Indeed, members of the family lived there until 2000, 100 years in total! 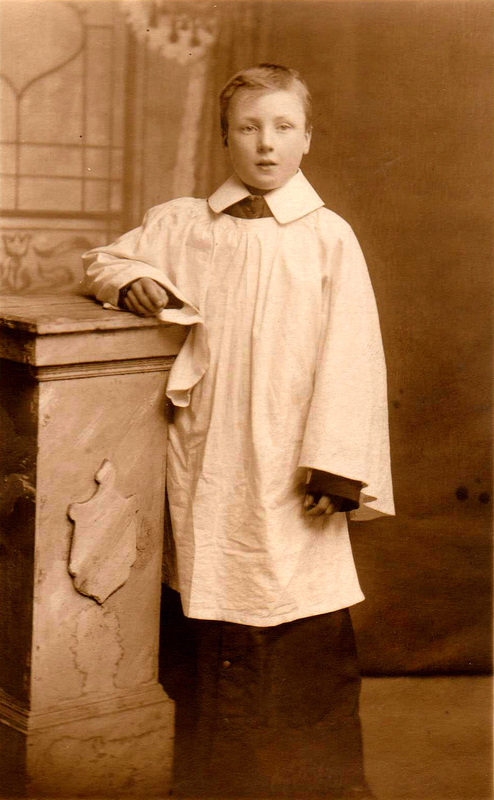 Donald was the youngest of eleven children, two dying in infancy and two (Gordon and Hedley) died fighting in WW1. 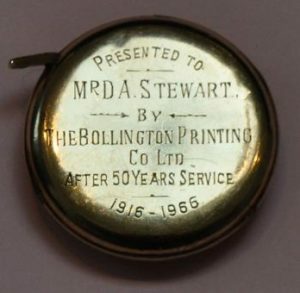 He worked, from the age of 14, and for most of his life, with The Bollington Printing Co. Ltd. based at Oak Bank mill (where Hamson Drive is today). After 50 years with the company he was presented with a watch (picture left). At one point he was a sales representative selling studs – collar studs and cuff links – to the trade. That was in the days when men, including the so called working classes, wore shirts with removable collars. The studs were mounted on cards for retail display in barber’s and hardware shops. These photos show Donald as a choir boy, in a smart blazer aged 12, and on his motorbike on Beeston Mount. Click on photos to enlarge. I ( Tim Boddington ) got to know him in the late 1970s (after his wife, Stella, had died) as a fine old gentleman. We frequently met in the Crown Inn and shared a few pints together. 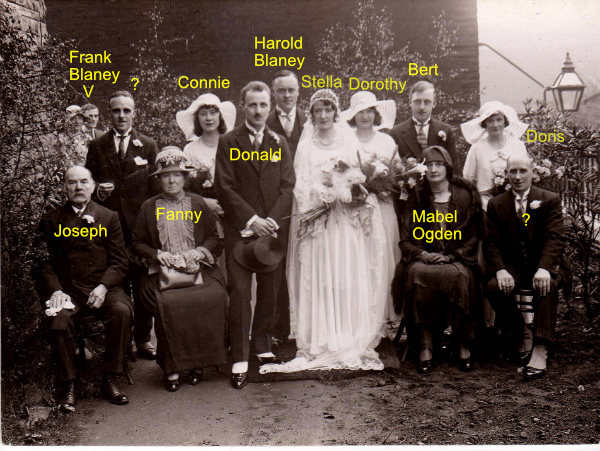 In 1931 Donald married Stella Ogden (1904-1978) – see the wedding photo below. 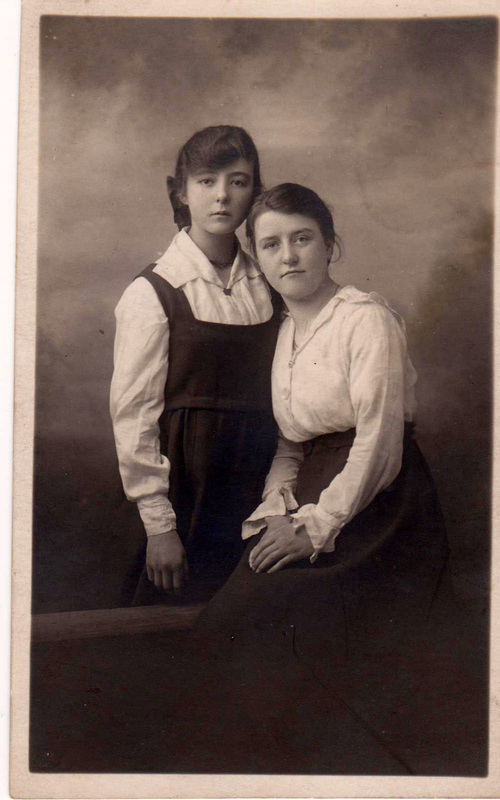 Stella had come down from Prestwich with her stepmother Mabel Burgess, and they both worked at Endon Hall as silver service waitresses. They lived in Endon Lodge (known locally as the `Threepenny Bit house’ because of its hexagonal shape!) on Clarke Lane / Oak Lane. 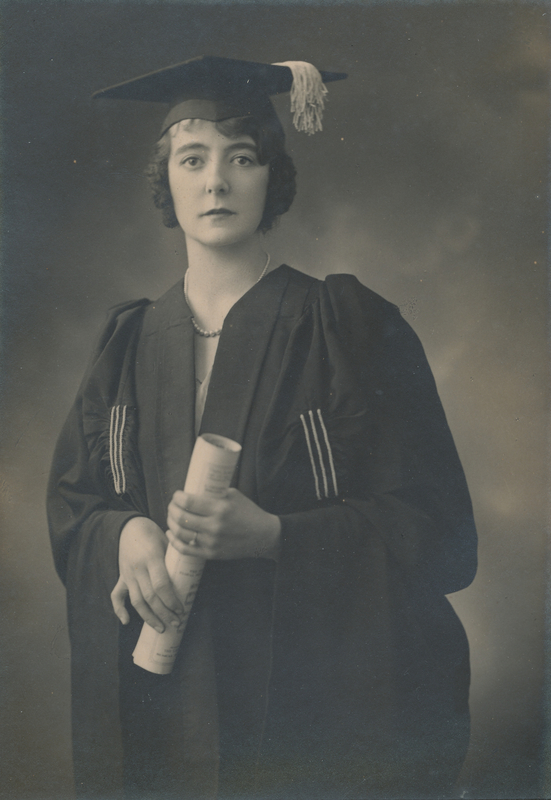 The pictures below are of Endon Lodge, Stella (standing, Mabel sitting) and Stella when she received her diploma (ALCM) for piano. Click on photos to enlarge. In the 1960s after Donald retired from Oak Bank Mill, he and Stella took the Dog & Partridge Inn. He was known for his good humour and long hours – this was a pub that was often open right through the night! And the police station was next door, in fact the Bridewell [jail] was in the back yard of the pub! See below for D&P stories! Donald died in 1987 while living at Shrigley Court. 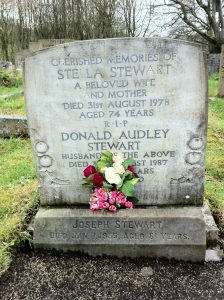 His wife Stella died exactly 9 years to the day before him in 1978. Both are buried in St Johns churchyard. The anecdote that will remain with me ( Tim ) always concerned the building of the ‘new’ chimney at Oak Bank mill printing works. This chimney was built in 1912 and was around 200 feet high. During its construction it was clothed in scaffolding and ladders. One weekend, when the site was deserted, the 10 year old Donald, together with Beattie his sister (aged 12), climbed to the very top of the scaffolding to play! The very thought sends shivers down the spine. 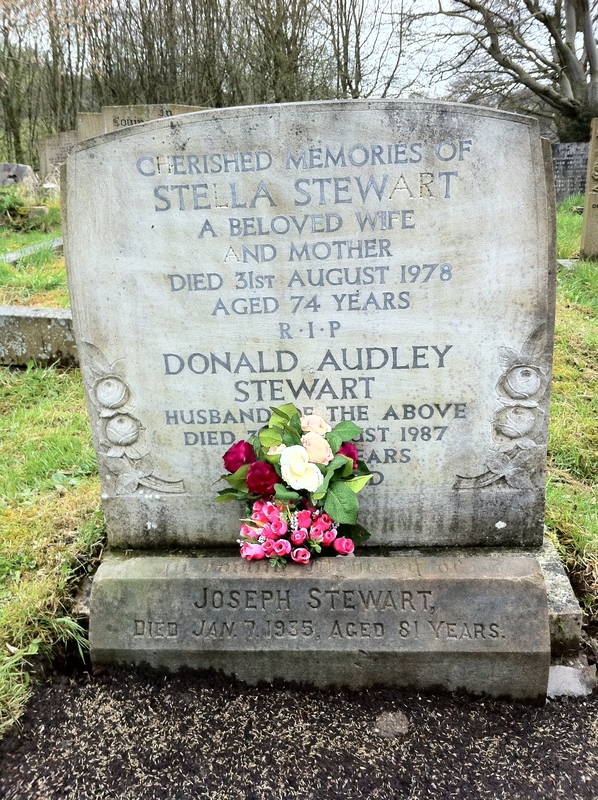 Donald and Stella had 2 children Pamela and Michael Stewart. 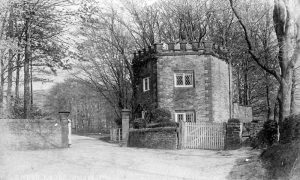 Donald’s granddaughter (and Michael’s daughter) Linda Bester continues to live in Bollington today (2018). Donald was too young to be involved in WW1 and too old for WW2 but he was in the Homeguard. When prompted by son Michael as to what his duties were he replied `to stand on White Nancy looking for enemy aircraft`. Asked then “how many of you were up there? ”. He replied `Half of Bollington` ! Beattie Stewart 1900-1979, worked at Ingersley Vale Bleach works. Married Fred Bamford. Gill Coe: …. We used to go to the Dog and Partridge when Donald was landlord. He was a star. Used to leave the pub on Friday just as it was coming light. Linda Bester (Donald Stewart’s granddaughter): Thanks Gill, I would love to hear more about all that, apparently people came from miles around to see the banter between him and my grandmother Stella. Please tell me more ……. Gill Coe: One night there was a post horn on the wall which someone decided to play. A phone call from the police station [next door!] came at around 3am saying please be quiet as the police sargeant was in bed and thought there was a band coming up Adlington Road. Donald one night took out his false teeth which one of the dogs ate. They were very happy days and Donald and Stella were the best. His pet saying was “keep those balls swinging” which were two glass balls above the bar which he used to bang together. Linda Bester: Haha, he was such a comedian. The dog that ate his teeth was most likely Bessie the black lab. Thanks for that Gill. 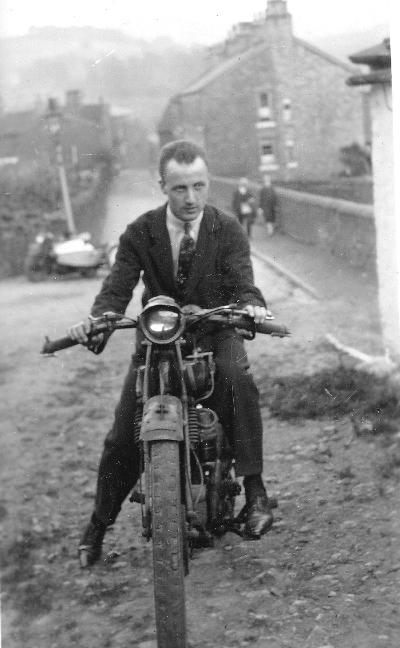 This is a picture taken at Donald and Stella’s wedding, outside Bollington Conservative Club (of which his father Joseph Stewart was a founding member), on Adlington Road, in June 1931 (Donald was 29).